This is the latest offering from Studio Ghibli (Howls Moving Castle, Spirited Away) and it is every bit as impressive as all of their previous films. 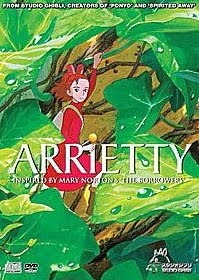 Arrietty is the directorial debut of Hiromasa Yonebayashi (Studio Ghibli's star animator) and was originally released in Japanese under the title "The Borrower Arrietty". This version has been translated beautifully into English and stars Olivia Colman (Hot Fuzz, Tyrannosaur), Mark Strong (Tinker, Tailor, Soldier, Spy), Saoirse Ronan (The Lovely Bones) and Tom Holland (Billy Elliot the stage show). As you would expect from a Studio Ghibli production, the animation is gorgeous, colourful and vibrant and drawn with incredible attention to detail. The story itself is an adaptation of "The Borrowers", written by Mary Norton and is a heartwarming tale suitable for all age groups that will entertain the whole family, adults and children alike. In terms of extras, if you purchase the Blu-ray Double Play or Deluxe edition (well worth it in my opinion) you get various special features: Storyboards, Trailers and Japanese TV spots, Interviews with Hayao Miyazaki and Hiromasa Yonebayashi, Cecile Corbel- Arrietty's song, Promotional video. All in all I can't recommend this film enough. It is a thoroughly enjoyable watch and something that you can sit down to again and again. Arrietty is now available to buy on DVD and Blu-ray .